Are you in Hana?, a text bleeps in. “Sorry,” I say to Mapuana, my guide, while powering off my phone, something I haven’t bothered to do since arriving at Travaasa Hana on Maui’s eastern shore, where cell service blows in and out with the ocean breezes. Mapuana smiles, unaffected by the disturbance. “Now I am going to lead us in a Hawaiian chant,” she explains, asking the kupuna, or elders, for guidance. She shifts into the Hawaiian language. She closes her eyes, so I close mine. The birds , the wind gusts are scented with plumeria, and humidity hangs in the air. All are signs, in my naive city-girl opinion, that Mapuana is conjuring invisible forces, who may, I fear, arrive and ask me what I wish for. I’ve heard of the magic of Hana—I’ve even come here intrigued by it—but I’m well over the age of being able to blithely blurt out a wish (“I wish I were a ballerina,” “I wish for a million dollars”), each one fraught with consequences. Or so I thought before I drove here on the Road to Hana two days ago. The road, a curvy “two” laner, rambles east from the airport about 68 miles, crossing single-lane bridges and passing waterfalls, bamboo forests, and natural pools. With its top speeds averaging 25 mph, I had plenty of time to think, mostly about banana bread (thanks to all the handmade signs hanging from trees), about whether it’s worse to be a driver or a passenger (depends on your control issues), and what your driving style says about your ego (impolite drivers don’t use turnouts). Nearly two hours later, I came upon the ink-dot town of Hana: a Hawaiian Bali Hai framed by the slopes of a dormant volcano, with a prim and proper 1800s church, a ballfield, and a bay of fishermen, all set within an edible forest of taro, breadfruit, banana, mango, and papaya. Surely one element of Hana’s magic is the security of knowing you’ll never go hungry. I pulled into the porte cochere of the hotel a little frazzled from my journey of many weather systems. Rain. No rain. Rain. Mist. No rain. Rain. Sun. Rainbow. Then the weirdest thing—perhaps a bit of magic—happened. I exited my car and felt incredibly slowed down. As if I were walking through pudding. This other­worldly fantasy continued when I passed a banana tree branch, heavy with fruit, hanging from the lobby rafter. I did a double take. “Go ahead. Take one,” said the receptionist. So I plucked off a banana, peeled it, and ate it. Tangy grassy flavors like nothing I had ever tasted, with no money exchanged—currency suddenly a strange custom of another world. I ambled to my cottage, where the air-conditioning was a simple fan, the lanai faced a roaring sea, and two horses trotted by without riders. Which brings me to my morning chant with Mapuana Kalaniopio-Cook, my guide from the hotel, who wants to show me Hana as it would have looked when the first settlers lived there, in the 500s to 800s. I glance at the quiet ranchland. Fruit trees. Pumice rock walls. A cow. Mapuana herself with long black hair, plumeria tucked behind her ear. She doesn’t have to work very hard to make her point—minus the hotel, I imagine the past looked just about like this. 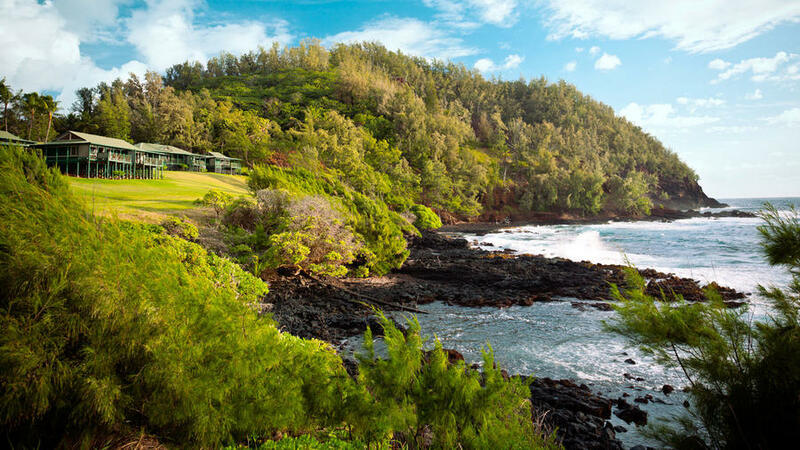 We walk to the village on foot and follow the road to a cliff overlooking Hana Bay. It was here, Mapuana tells me, that the god Maui turned his daughter Noe Noe into a misty rain, and her forbidden lover, Ka‘uiki, into a hill. The cliff Mapuana and I are standing on? Ka‘uiki Hill. And the rain that’s now begun to mist our faces? Noe Noe. The story stirs something in me. It’s as if the gods are still in charge here—­­and thousands of miles away from the i-universe chattering back home, people still listen to them. Later that evening at the hotel bar, I quiz a regular guest about Hana’s magic and the practical theories: that its volcanic soil has a high mineral content, that there are more kahunas (magic men) here. She lays it out for me this way: “You’re not going to find anything scientific about it. You either feel it or you don’t.” A tropical breeze blows through the open windows, and a man sitting on a stool starts plucking a ukulele. A woman with nut brown skin and a bright orange muumuu begins moving her arms gracefully. The palm fronds outside flutter, almost in time to her motions. In this moment, I understand it: Hana’s magic is not mystical. The real magic lies in what isn’t here. The long and winding road to get here, a skinny pipeline, allows only tiny drips of the 21st century through. It’s a place where bananas are still plucked from trees, storytelling lives on in legends about gods and in hula, horses run wild, and the wind is your air-conditioning. So if the ku-puna are listening, here is my wish: Please don’t widen the road.